I had rye bread in the freezer and wanted to take it to our Fourth of July cookout as I did not have time to bake anything new for the occasion. But what to serve with it? 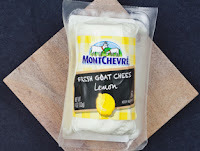 I had recently discovered this lovely MontChevre lemon goat cheese at Treasure Island when I was looking for something to go with a loaf of rye I had made earlier. Goat cheese and lemon make for a heavenly combination. I planned to take that but I wanted something extra to make it a more substantial dish. So I thought about what might go well with rye bread and cheese and decided that some form of fruit would work well. Having recently discovered the most delicious Turkish dried apricots at Nuts.com, my go-to place for that kind of thing, I went looking for recipes that included them and found a recipe for Apricot Chutney that I had marked years ago as something that had potential. I had all of the ingredients on hand and it looked quick and easy so I gave it a try. It was delicious and the perfect complement to the lemony goat cheese and was a huge success. It works well as an accompaniment to dals and curries and pairs well with chicken and lamb as well. This is one of those big reward for little effort kinds of things. You can't go wrong with it. I did not add the sugar. It was sweet enough without it. Heat oil and curry powder in a 2-quart saucepan over medium heat. Cook, stirring frequently, until curry powder is fragrant, about 2 minutes. Add onion, garlic, and ginger and cook, stirring occasionally, until soft, about 10 minutes. 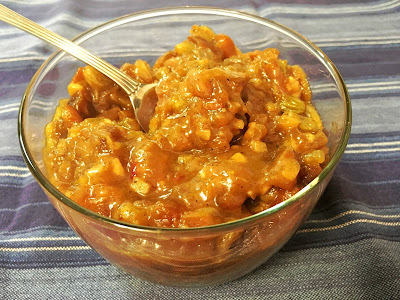 Add apricots and raisins along with 1 cup water, lime juice, and sugar (if using). Cook, stirring occasionally, until thickened, about 20 minutes.